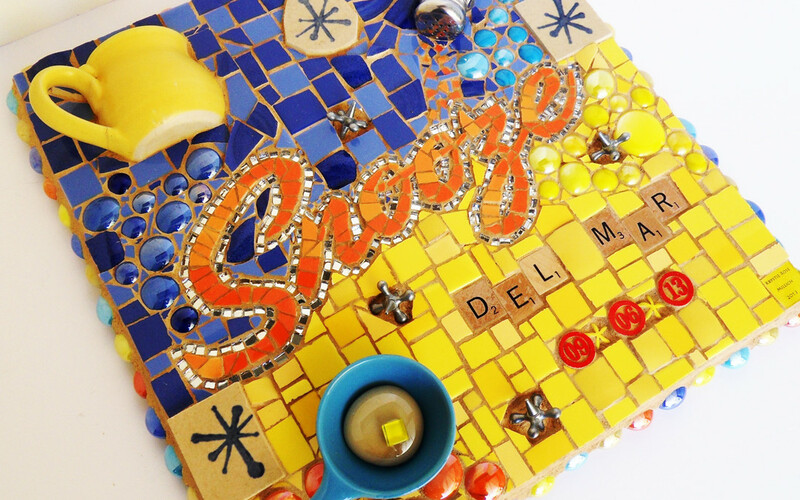 Happy to report that my commission for Snooze, an a.m. eatery, was completed and delivered to the folks at Snooze Soglo (Southglenn/Centennial, CO) to all sign and forward on to their much-missed former Manager, J.D., at the new Snooze Del Mar (California)! The folks at Snooze Soglo said that they were “blown away” and that it was “better than they expected” and that J.D. was “speechless and very touched”. Well…I just can’t ask for anything better than that, can I?! I LOVE making original art and also love making things for people that make them happy, inspired, proud, and all that! What a great thing to be able to do; I can hardly believe it! And, Snooze and everyone who works there are just so, so awesome! If you’ve never been to one of their fantastic breakfast/lunch locations, do check them out in Colorado, California, or now Arizona! www.snoozeeatery.com Their food is incredible (I am a pancake maniac, but their salty, savory, and other creations are all to die for!) and the people are dedicated to providing great service and atmosphere, as well as giving back to their local communities (which, if you know me and my artwork, I am always dedicated to as well!)! 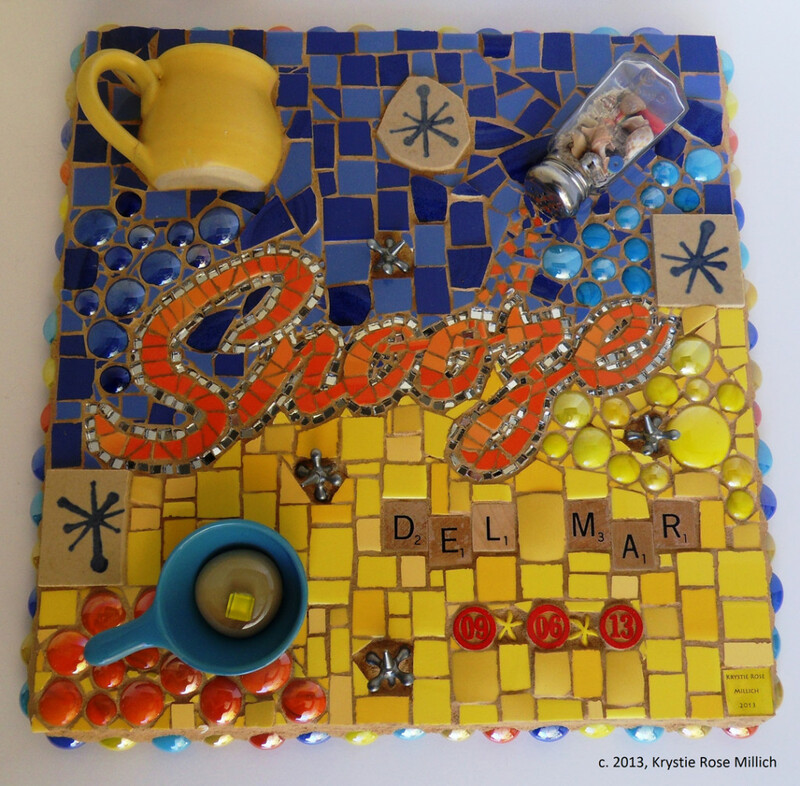 This piece was really, really fun to make; they wanted it to include “Snooze”, “Del Mar”, and the Del Mar opening date, but otherwise gave me creative freedom to create a piece that reflected their brand, people, and atmosphere. I used lots of pieces of their original dishware, including yellow, blue, and tan stoneware pieces with their signature “jack” design. The Snooze name is their actual logo and the colors are reflective of their fun, retro atmosphere in each location. The salt shaker is filled with beach sand, seashells (for Del Mar’s proximity to the beach), some hearts for the love they put into their food and work, and some rainbow beads for their wonderful support of diversity. THANK YOU, Snooze’ers!!! If you or someone you know has a business, non-profit, or individual that you would like to have a custom mosaic made for, please contact me and we can talk about what you’re looking for and come up with a wonderful, original piece of art! I can create custom wall pieces, sculptural pieces, murals, backsplashes, signage, or any number of other pieces. Let’s talk and see what we can come up with!